What happened? This is great work. It's a kick to see your old drawings from back in the days of innocent excitement, isn't it? 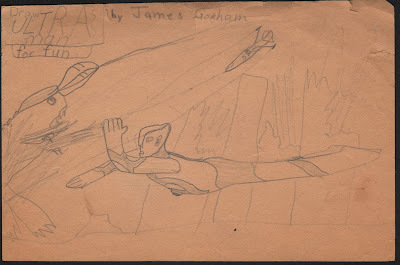 I wish I had more examples of my artwork from when I was young. Well, I didn't know it existed. Mom hoarded so much crap that after going through it I found gems like this. Absolutely scan all of it. Post a bunch.